The old saying about your pants catching fire if you tell tall tales may have come true when a lawyer reportedly had to flee a Miami court while defending a client charged with arson. 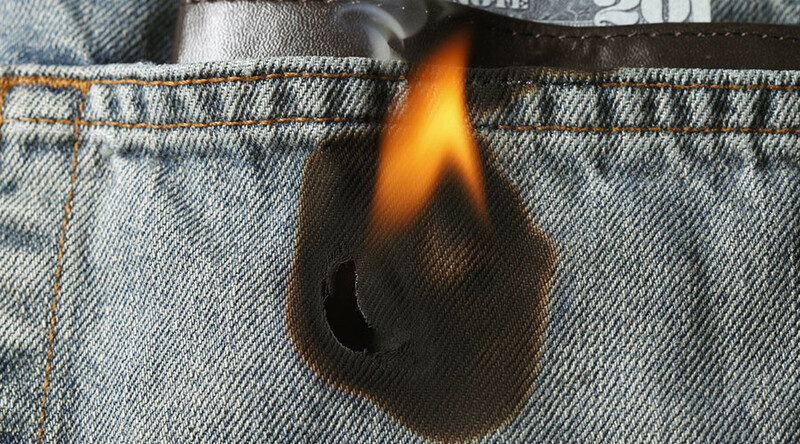 Attorney Stephen Guterriez’s pants literally erupted into flames. Gutierrez was in court Wednesday defending a client accused of intentionally setting fire to his own vehicle when the bizarre incident unfolded, the Miami Herald reported. Gutierrez, who runs his own law firm in the Miami-Fort Lauderdale area, had been putting forward a case for Claudy Charles. Gutierrez had reportedly argued that Charles’ car spontaneously combusted, before clouds of smoke began to come from his own suit trousers. According to WPXI, Gutierrez then ran from the courtroom and returned to explain that an e-cigarette device had caused his trousers to catch fire. The timing of the blaze has led to questions over whether the fire was actually a bizarre attempt by Gutierrez to get his client off the charges – a suggestion the 28-year-old lawyer denies. E-cigarettes have been known to combust, causing harm. It’s not clear if the lawyer suffered any injuries, but the Miami Herald reports that prosecutors are assessing if Gutierrez has committed contempt of court. Claudy Charles was later convicted by the jury of arson.